Text Adventures. The very words bring back fond memories for those of us old enough to remember a time when games did not have any or had limited graphics and blank stares from those who are too young to have played them. Back in the early days of gaming, the only way to tell stories was via text, and players had to learn how to type back recognizable commands so the story can unfold. Adventure, Zork, Eric the Unready…. These games bring back fond and sometimes frustrating memories of gaming’s past. For me, one game trumped all the others. Filled with great writing, irreverent humor and a story which was completely and utterly ridiculous, The Hitchhiker’s Guide to the Galaxy was the game I spent the most time playing. The combination of Infocom’s familiarity with the genre with the writing of Douglas Adams makes for a game which is still just as fun to play today as it was then. This is how I remember playing Hitchhiker’s Guide. The Hitchhiker’s Guide to the Galaxy game opens at pretty much the same point the book does. For those who are not familiar with the series, you start out controlling Arthur Dent, a typical Englishman who is about to have a not so typical day. First, he has to lay down in front of a bulldozer to keep the city from demolishing his house to make way for a freeway bypass. Then he finds out his best friend Ford Prefect is actually from another planet. After that, well, the Earth is destroyed to make way for a hyperspace bypass. Like I said, Arthur Dent is having a not so typical day. The books for The Hitchhiker’s Guide to the Galaxy are known for their outrageous and completely irreverent humor, and the game has this in spades. A great example of this is all the various things you must put in their proper places in order to actually get the Babel Fish, a fish that translates languages, into Arthur’s ear. First, you must take off Arthur’s dressing gown and hang it on a hook. Then you must take Ford Prefect’s towel and place it over a grate. 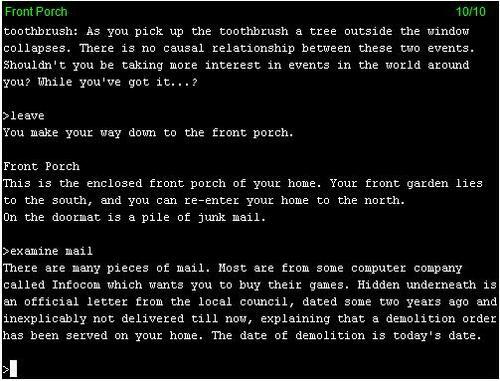 You will then take Ford’s satchel and place it in front of a hole in the wall and place some junk mail you hopefully grabbed from your porch in the early part of the game on the satchel. Why do you need all of that? Well, when you hit the button to dispense the fish, it shoots across the room, and the only thing that keeps it from flying through a vent in the wall is the dressing gown. It then slides down the grown and lands on the towel as opposed to falling through the grate. A little robot comes out of the wall, grabs the fish, and on its way back collides with the satchel, sending the junk mail and the fish flying in the air. A second robot shows up to clean up, but as it must focus on getting the wayward mail, it is too busy to grab the fish, which subsequently lands in Arthur’s ear. Did I mention this was before the time of internet chat rooms and hint sites? That’s right; you had to figure this all out via trial and error. As frustrating as that could be, the game was so insanely clever it kept you coming back for more. Fortunately, there was a scoring system that would give you clues as to when you did things right. Just in case you were not aware, The Hitchhiker’s Guide to the Galaxy actually exists within the universe. It is an electronic publication for which Ford Prefect is writing, and in the game, it becomes a character in and of itself. Not only will you look up different Guide entries throughout the game, but at times you will be given different footnotes you can type in to get a little more insight. One of these footnotes is even a self referencing note about how much fun it is to look up the footnotes. The 20th Anniversay edition added some rather nice illustrations. So maybe you are reading this and wishing you had a chance to try this game out. The good news is you can. DouglasAdams.com has the game in flash version up on the site, and you can play it in all of its original text only glory. If you would rather play a version with some graphical interfacing and the ability to save your progress, you can check out the 20th Anniversary edition on the BCC Website. Both sites give you a chance to experience the game completely for free, and it is a great way to relive old memories or experience one of the best text adventures ever made for the first time. As much as I enjoyed this game as a kid, I did not come to truly appreciate it until I read the series years later. It is rather impressive to see just how much of the book Adams and Infocom managed to cram into the game itself. The game sold over 350,000 copies in 1984, making it one of the best-selling titles of its era. Not long after its release, graphic adventures began to hit the market, and the text adventure became a ghost of gaming’s past until the internet brought about a renaissance of the genre. That renaissance has enabled more and more gamers and fans of Adams’ work to play this remarkable game. The Hitchhiker’s Guide to the Galaxy gets a 9 out of 10. 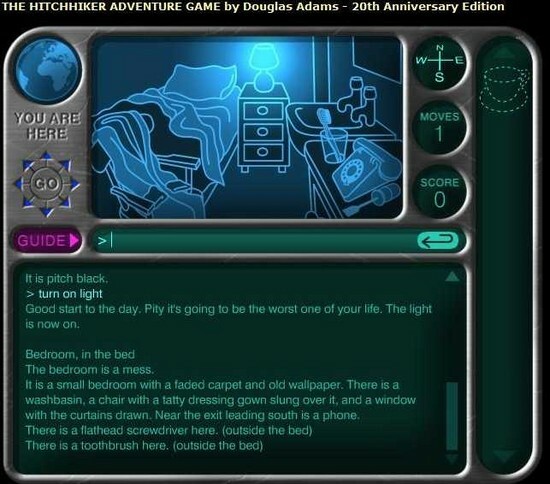 This entry was posted in 30 Reviews in 30 Days, Retro, Retro Active, Reviews and tagged don't panic, douglas adams, hitchhiker's guide to the galaxy, infocom, text adventture. Bookmark the permalink.